Quality light-blocking curtains are a must-have accessory for any bedroom, home office, TV viewing room or other area of the home where it can be beneficial to limit the amount of natural light entering the room. Eclipse Curtains recently sent me a complimentary pair of their blackout curtain panels to test, and I am very excited to report that these great-looking and affordable window treatments perform exactly as promised! Eclipse Curtains offers a line of budget-friendly curtains that are as functional as they are attractive. The company indicates that its products are designed to "provide privacy, manage light, reduce noise, and help with energy savings, without sacrificing the latest looks in window fashion." Eclipse offers a full line of curtains in varying levels of "opacity," two of which would be considered to provide the full level of light blocking coverage typically associated with window treatments that would be described using the term blackout. Their other styles do not block as much light, and are instead described as "room darkening" and "light filtering" styles. For this review, I tested Eclipse's Lorcan curtain style, which falls in their "black out" opacity category. My overall review of these curtains is very positive. 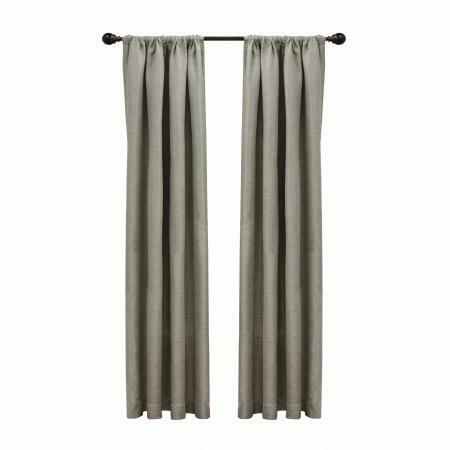 I am using these curtains in the master bedroom of my home, and find them to be preferable to window treatments with a lesser degree of opacity that I have used previously. While a small amount of light filters in (which I like), these curtains provide an ideal level of darkness for sleeping. They aren't quite stark as the absolute zero option would be. Even with a porch light on directly outside of the room where the curtains are being used, these curtains help to create a peaceful darkness inside that sets the stage for a good night of restful sleep. Not only do these window treatments do a terrific job filtering out light, they are also an attractive addition to the room's decor. The fabric has a woven texture that is perfect for any room decorated in a casual, earthy style. These curtains also have a smooth backing, which is responsible for much of their light-filtering capacity. I particularly love the fact that these curtains are created from fabric made from yarn that was manufactured from plastic bottles that have been recycled. You'd never guess that from the look or feel of the curtains, but I like knowing that I am able to add a functional and decorative touch to my home using a product made from recycled materials. The fabric is not the only environmentally-friendly feature to keep in mind with these curtains, as well as others that filter out light at this high level. Curtains that block this much light help to moderate the temperature in the room, even when it is hot and sunny outside. So, using this type of curtain in various locations throughout your home can help reduce your energy consumption and the associated energy bills. These curtains are easy to find, come in a variety of styles and are affordable. Eclipse's Lorcan style is available at Target for $20 - $30 per panel, depending on length. All panels are 52 inches wide. The style comes in four lengths (62, 84, 95 and 108 inches). Color options are natural (pictured above), tan, blue and a dark shade of grey. I actually like these curtains so much and find them to be such a good value that I am planning to purchase a second set to use in the media room in my house. I just have not yet decided if I'll purchase another set of the Lorcan style or opt for one of their other equally attractive (and affordable!) styles. I actually have my eye on their Rowland panel, as it offers the same level of light filtering and comes in a lovely chocolate tone that just might be perfect for the room I have in mind!